Battle Mountain Cross Country closed out the regular season in Rifle last Thursday with a win and top 4 finish for the girls and boys respectively. Coming off a weekend where the Huskies ran blazing fast at Delta, with every runner finishing in under 30 minutes and 28 runners lettering, you could have excused the Huskies if they took it easy in Rifle. Instead, both the girls and boys ran tough and again put everyone under 30 minutes. Just for good measure they added one more varsity letter winner to their ranks as well. Western Slope, meet the Hardings. Lizzy and Naomi Harding are freshman who look to be in the mix at the top of the pack for the league and regional meet. Immediately the Hardings, along with senior Alondra Aguirre, went to the lead group in the race. The three Huskies stayed in a tight group for the first half mile before Summit County’s Ruthie Boyd began to really press the pace. Lizzie and Naomi hung on for almost 2 miles before the veteran runners from Steamboat, Summit and Rifle were able to string the lead group out. Meanwhile, sophomore Megan Bamford was moving up through the ranks from mid pack. The Hardings went 4-5 with Bamford passing 3 people in the final 300 meters to finish 11th. Another young runner, Isabelle McMurrain came in next just behind Bamford in 13th, while Aguirre rounded out the scoring for the Huskies in 23rd. 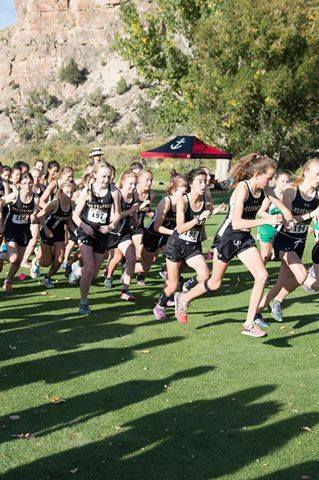 It was a dominant win, with only 56 points and 6th and 7th runners Coco Spangler (27th) and Jordan Denning (28th) displacing scorers from every team except Steamboat. The Battle Mountain boys did not win the meet, but had a tight pack in the top 33 and a breakout performance from sophomore Conner McCabe. Isac Sotelo took top honors for the Huskies running 18:09 for 8th place after sticking his nose in it with the leaders early in the race. Behind him McCabe ran a lifetime PR for 21st place overall. His official time of 18:29.97 was 3 hundredths under the time requirement for a varsity letter and McCabe became the answer BMHS XC Trivia nerds (they are out there) will have to memorize. Twenty-nine athletes have run under the time requirement to letter during the 2015 season, more than any other year including during the 2005-2007 run of state championships. Finishing the scoring for the boys, Patrick Johnson (25th), Max Grimaldi (26th), and James Moran (28th) had a tight pack with the rest of the top 7, Doug McMurrain and Nick Williams, just behind in 29th and 30th respectively. The Region meet serves as both the league championship and the state qualifier. Finish top 4 teams in the region and you qualify for state as a team. Individuals can finish in the top 15 and make it on their own. Battle Mountain has quite the track record at this meet, having qualified for the meet 20 out of the last 22 races (that’s 10 out of 11 past years for girls and boys). While few teams around the state have made the big dance that many times in recent history, BMHS will need to run strong races to get out of a region that has #2 ranked Durango, young and talented Glenwood Springs and a strong down valley rival in Eagle Valley on the boys side. BMHS boys have been ranked #3 almost all season, but have only had a chance to race Durango twice, very early in the year. The Husky Girls are currently ranked #2 in the state, but will have to beat out the likes of Steamboat Springs and perennial contender Summit County. The girls will be chasing a record of their own. Currently they have won 4 regional titles in a row. The regional meet is also the league meet, and 5 in a row would be the most championships for any team EVER at Battle Mountain. Soccer, girls XC and Boys XC all have won 4 in a row, but 5 hasn’t happened. The post season team has quite a mix of old and new. For the girls, seniors Rychelle Denardo, Hannah Gaylord, Megan Rossman, Melissa Delgado, and Anabel Johnson have all been to the region meet before. Sophomores Alex Raichart, Kaela Fahrney, Megan Bamford, and Elizabeth Constien and senior Alondra Aguirre have all run at big time meets in track, but won’t be quite as familiar with the Delta course. Freshmen Lizzy and Naomi Harding will be running at their first post season meet in Delta. The boys are a little more seasoned, led by seniors Jake Borel, Ethan Pence and Koby Simonton, along with junior Alexis Aguirre having all run at Delta at least 3 times. Juniors Franklin Reilly, Nate Badger and Isac Sotelo will run at the meet for their 2nd time, while Patrick Johnson and Douglas McMurrain will make their league debuts. Max Grimaldi, Evan Fitzcharles and James Moran will serve as alternates. The Boys race will be on Friday at 1:30 p.m. will the girls will race at 2:00 p.m. The Delta course at Confluence Park is a spectator friendly event, and expected to have some blazing fast times. Follow @BMHSTRACKANDXC on twitter and Instagram for updates.